New Honor the Earth map on Enbridge Line 3. 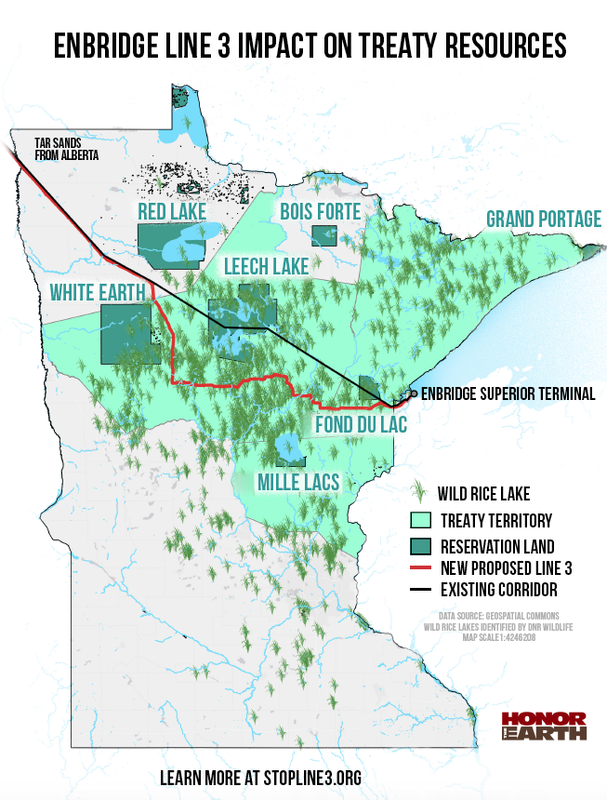 If you are a reader of this blog, mostly likely you are strongly opposed to the proposed expansion and reroute of a tar sands crude oil pipeline through northern Minnesota (see map at right). Enbridge has an old and failing Line 3 (the black line on the map). Enbridge proposes to abandon that line in the ground and install a new, larger pipeline along a new route (the red line on the map.) That new route crosses the Mississippi headwaters and endangers clean lakes, rivers and wild rice beds, and all for nothing. Minnesota’s fossil fuel demand is actually declining. If you are like a lot of people, you want to have your voice heard but don’t have to time to wade through the hundreds of pages in the recently released draft Environmental Impact Statement (DEIS). Even the most ardent opponents struggle to get through it. We have created a separate Enbridge Line 3 tab on our blog to organize this kind of information about Line 3 and make it easy to find. If you think we are missing content, please send us a comment. Keep reading to get a taste of some of the fact sheets’ analysis. Enbridge has one of the worst safety records of major pipeline companies and was called out as incompetent by the National Transportation Safety Board for its role in the massive 800,000 gallon spill in Michigan’s Kalamazoo River in 2010. Enbridge’s pipelines had more than 800 spills in the U.S. and Canada between 1999 and 2010, leaking 6.8 million gallons of oil. For more info and insights, click and read the fact sheets. The state will take public comments through July 10. Based on public comments, it will amend the EIS and release a final version.